Mark your calendars, ladies and gents! October isn’t just the month we celebrate fear and scary monsters. It is also the month we like to raise awareness about sight. Every year for the past five years, the World Health Organization has observed World Sight Day on the second Thursday in October. This year, we welcome World Sight Day on October 12th. Set your calendars, because you’re not going to want to miss it. Now, you may be thinking way we need a World Sight Day. Why are we raising awareness for something that everyone is aware of? Good question. We have to raise awareness because many people fail to take care of their eye health. World Sight Day began in 2012 in an attempt to raise awareness about blindness and visual impairments around the world. We are lucky to live in a country with excellent health care. When someone is visually impaired or blind in the U.S., it is often because there is no cure for whatever damaged their sight. However, around the world, more and more people are developing visual impairments caused by things that are completely preventable. For this reason, the World Health Organization decided to raise awareness about the state of vision around the world. According to an infographic put together by the International Agency for the Prevention of Blindness (IAPB) over 285 million people are visually impaired around the world. Fortunately, 80 percent of vision impairment cases are preventable. Unfortunately, the health care to prevent vision impairment is not readily available to many people. Ninety percent of people with vision impairments live in developing countries. This isn’t to say that eye health care isn’t available in these areas of the world, because it is. However, healthcare is something available to the rich and those living in more urban areas. If you’re poor and living in a rural village in Africa, your chances of visiting an eye doctor are slim. These are some hefty obstacles to overcome, but the World Health Organization, with the help of other organizations such as the IAPB, are confident that they can achieve their goals by 2019. What are those goals, you may ask? 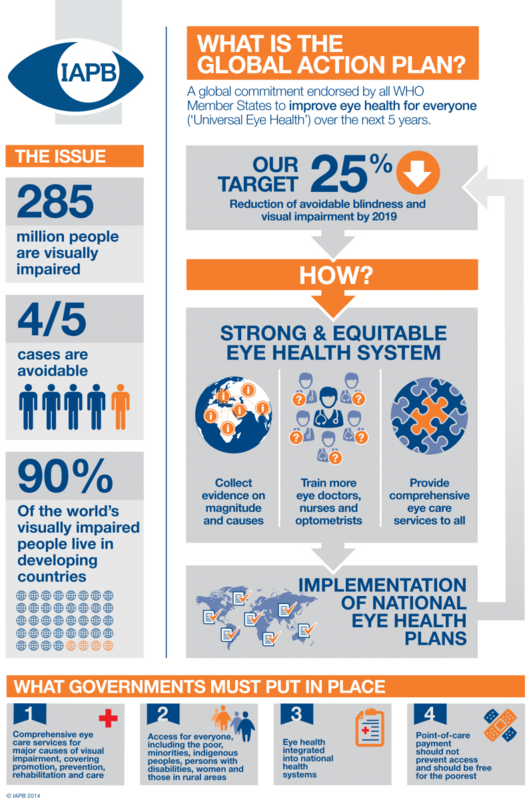 The main goal: reduce the number of people affected by preventable vision impairments and blindness. But you may have guessed that already. In more specific terms, the World Health Organization is looking to reduce that 90 percent down to 65 percent of people affected by these preventable impairments. It may not seem like much when put into percentages (65 percent is still a high percentage! ), but it would be a significant change. Think about it in terms of people, because that is who we’re dealing with here. Actual people, not just statistics. To reduce the amount of people affected by preventable vision impairments by 25 percent means to save 71.25 million pairs of eyes! The World Health Organization has given themselves a five year deadline to achieve this 25 percent reduction goal. This journey began in 2014, which means that by the second Thursday of October 2019, we should be down to 65 percent of preventable blindness around the world. It’s easy to set goals and deadlines, so what are these organizations doing to actually attain their goals? First, the aforementioned social obstacles need to be eliminated. This is possibly the most difficult challenge. Things like social classes and discrimination are not things that can disappear at the snap of a finger. Often these ideas are deeply rooted in a culture and a certain type of mindset. The way around this is to change minds. To show people that we are all the same no matter our background, financially situation, gender or skin color. Not to sound like an ethics course, but to change the world, we need to change minds. The second thing that needs to be done is to train more eye doctors. There is a severe shortage of doctors in general in many developing countries. Vision health is not a priority to many people when it should be. More trained doctors lead to the third thing that needs to be done, which is to be able to provide comprehensive eye exams. A comprehensive eye exam will detect any disease that could cause vision impairments and blindness before it’s too late to treat. The sooner diseases are spotted, the more effective treatments will be. Last but not least, lots and lots of data needs to be recorded. Without data and evidence that vision care in developing countries is a problem, no government will believe it. Without the government on our side, it will be more difficult to implement national vision care plans around the world. Governments need to put into place vision care plans that are accessible to all. This is why raising awareness about the terrible state the world’s vision health is in is so important. Getting involved in World Sight Day is easy! Get your friends together and talk about what you’ve learned. Spread the word that there is a vision crisis happening all over the world. If you’d like to be more involved, certain organizations accept donations that will help bring sight to people all over the world. Stay updated and follow the IAPB website for new info that will be made available on October 12, 2017! « My Eyes Are Becoming Sensitive to Light, Should I Be Concerned? ← My Eyes Are Becoming Sensitive to Light, Should I Be Concerned?